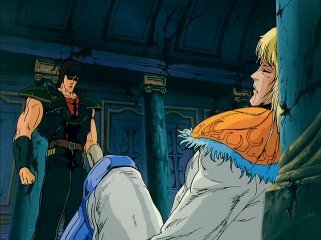 On the 3rd of March 1986, Hokuto no Ken was released in Japanese cinemas. 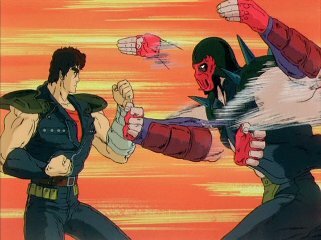 The film is a re-telling of the story from the beginning, up to Kenshiro's first battle with Raoh. 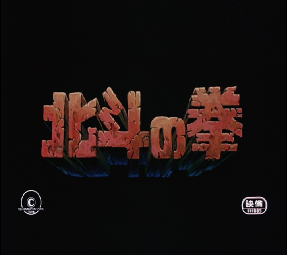 As the movie has a run time of 110 minutes, many elements of the plot were changed (for example the characters Mamiya and Toki do not appear at all). 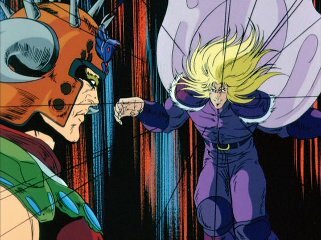 The movie is one of the most popular aspects of the franchise, and the first Hokuto no Ken media to be released outside of Japan. After several shots of the Earth, the narrator says that in the year 199X, the planet was put into a nuclear war. The narrator explains all the surviving people can do now is battle each other for such basics as food and water, whilst trying to keep themselves alive. 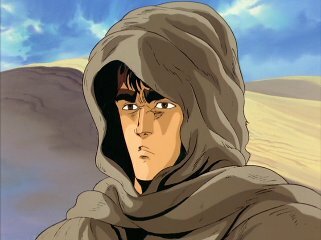 Sometime later, Kenshiro and Yuria are walking through a desert wasteland when they come across Shin, Ken's friend. However Shin announces that in this new age the strong can take what they want, and he says that he will take Yuria. Ken tries to stop him but he is defeated. 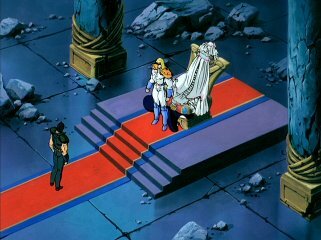 As this is going on, Raoh and Jagi are watching. Shin tells Ken that the reason he lost is because he had no ambition -and now he can die for it. Shin gives Ken seven scars, but Yuria stops him from killing Ken. Shin takes Yuria away, as Ken is left in the wasteland. Later on, Jagi throws Ken off a cliff. 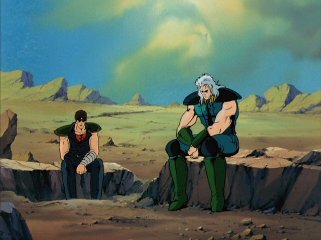 Raoh visits Ryuken and tells him that Kenshiro is dead. After revealing his dream of conquering the world and heavens, Ryuken says he cannot allow it. 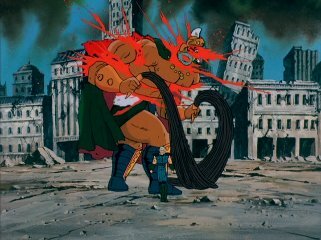 In an off-screen battle, Raoh defeats him. 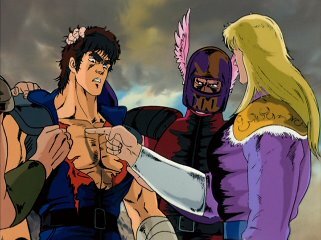 Sometime later, Kenshiro returns, having survived the fall and healed from his injuries, to save Bat and Lin from some punks. 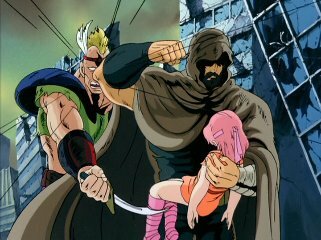 The kids take Ken back to their village, but shortly after arriving there the Zeed gang attacks. 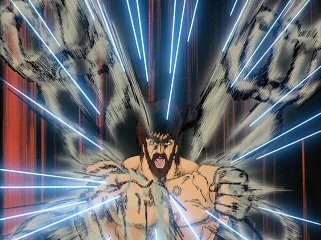 Kenshiro kills Zeed by using the Hokuto Hyakuretsu Ken (North Star 100 Crack Fist) technique. 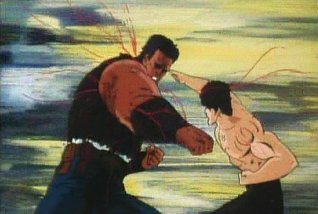 Rei, a master of Nanto Suicho Ken (South Star Waterfowl Fist), is after the man with seven scars as he has taken his sister, Airi. A chance meeting with Kenshiro in a village reveals that the man he is really after is Jagi. The two of them decide to team up and search for Jagi, eventually finding him at his fortress in a destroyed airport. Jagi tries to make Rei kill Ken, but Ken manages to appeal to Jagi's ego by calling him weak for relying on someone else to do his fighting for him. Jagi takes Ken up to the top of a building where the two fight, but Jagi is easily beaten and killed. 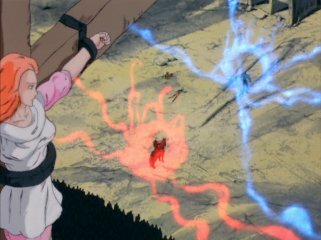 Rei kills all of Jagi's men and rescues his sister. As this is going on, Raoh has also been starting his plans for conquest. Renaming himself Ken-Oh (Fist King), he has created a large army and started to attack villages and put them into his control. Any resistance met is destroyed, as Raoh is shown killing King Fang and his entire clan. 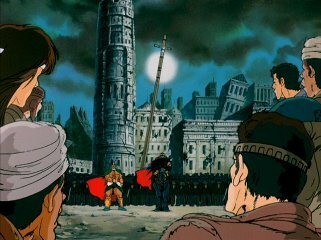 Word reaches Shin's city, Southern Cross, about Raoh's attacks. 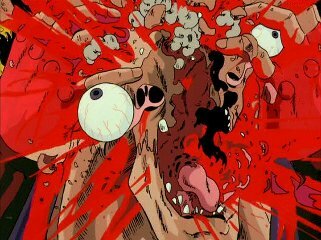 Shin also finds out that Kenshiro has defeated Jagi. Yuria happens to overhear this and decides to leave Southern Cross to try and find Kenshiro. 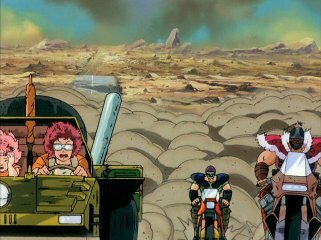 She attempts to leave through the underground, only to be found by Raoh. 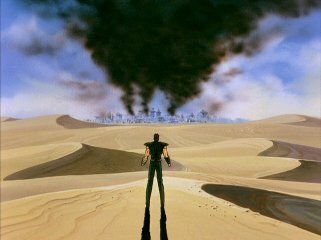 Kenshiro heads towards Southern Cross but when he finally sees the city, he can see smoke everywhere. Rushing in to it, he sees that there has been a major battle and that the city seems to be deserted. He head inside the palace to find Shin, seemingly still alive, and the two fight. 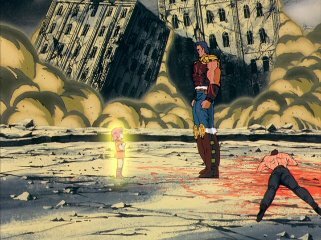 However their battle is brief as Ken learns that Raoh already critically injured Shin beforehand. 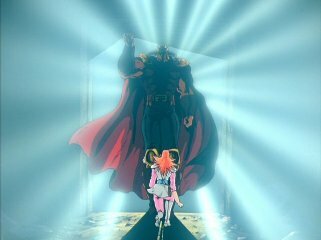 With his dying words, Shin explains to Ken that Raoh now has the name of "Ken-Oh" and plans to take over the world and conquer the heavens. 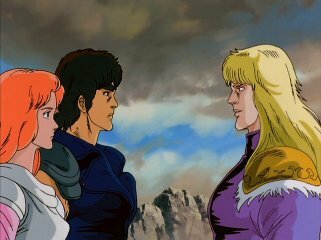 He and Yuria have gone to a place known as Cassandra, and he tells Kenshiro to also go there. 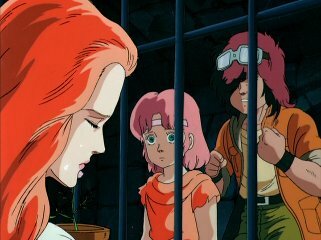 Meanwhile, Rei, Bat and Lin hear about Ken-Oh and how he has taken Yuria. Bat and Lin sneak into Cassandra and give Yuria a flower, but they then quickly leave as Ken-Oh is coming. Raoh sees Yuria's flower and demands to know were she got it from. 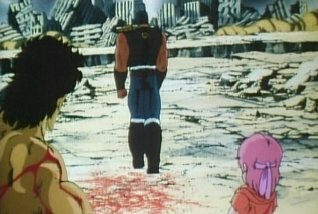 After refusing to tell her, Raoh decides to have her executed and the next morning she is tied to a cross in the middle of the city. Uighur asks the gathered crowds where this flower came from. Rei steps forward, saying he passed it to her. Rei and Uighur then fight, and Uighur is killed. Rei then challenges Ken-Oh to a fight. 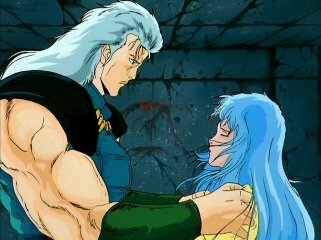 Kenshiro arrives in Cassandra just in time to see that Rei has been defeated. Rei dies after telling Ken that he must not fight with Roah now, as it is not the right time, they will both die if they do. Ken chooses to ignore his advice and takes on Raoh. The two batter each other, resulting in most of Cassandra being destroyed. 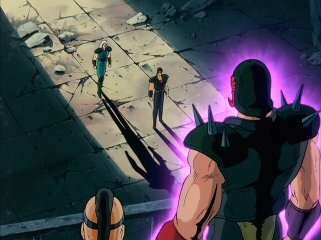 Raoh ultimately defeats Kenshiro and is about to kill him when Lin appears, asking them to stop fighting. 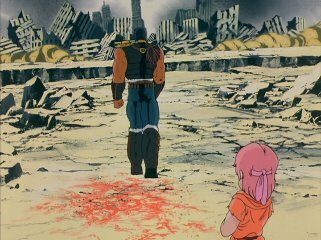 Raoh says that they should not have fought anyway as it was not the right time for them to do so, but he wants her to hurry and grow up. 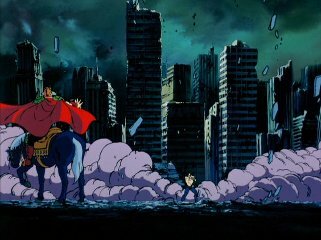 He leaves on his horse as later, a recovered Kenshiro wonders across the desert alone, looking for Yuria. When the movie was released in Japan, it made 18 billion yen. This would have been about the equivalent of 18 million U.S. dollars. I have no idea if this means it was success or not, unfortunately. I haven't been able to find out the budget for it either. But hey, when Aliens was released in Japan it only made the equivalent of 9 million U.S. dollars so at least gives me the excuse to make this. Straws. Clutching. And of course I can't find any reviews from Japanese film critics. When the movie was released in America some critics did review it though. 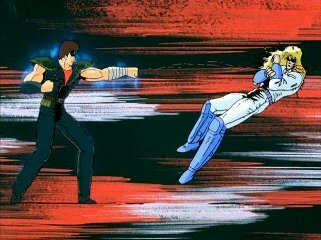 "Fist of the North Star is a gut-punching ecological fable (a stretch, but it's there), but watching it you'll feel as comfortable as a hemophiliac in a razor blade factory." "What the film, which opens today at the Cinema Village Third Avenue, lacks in coherent storytelling, it partly makes up for in visual flash." Reviewers weren't too keen on the violence, it seemed. Some also got confused by the story, which certainly wasn't helped by Streamline's poor translation (see below). As for my own thoughts? If anyone was to ask me where to start if they were trying to get into HnK, I would tell them to go and watch this movie (preferably the Japanese version). If they liked it, then I would recommend they go and see the anime series afterwards. As far as I'm concerned, the series has yet to look any better than this either, thanks to the bigger animation budget and the fact that I just don't like the look modern anime has, which the Legends of the True Savior feature. Most fans look on it favorably and for many fans outside Japan, it was the first time they go to experience Fist of the North Star and anime itself in general. When the movie was first announced in Japan, a strange trailer soon aired on TV which stated that the movie was coming, but the animation it featured mostly wasn't in the finished film at all. Instead, the preview trailer features lower quality animation (on par with an average episode from chapter 2 of the anime series) than the high quality animation the film features and shows oddities such as Rei about to fight King Fang (doesn't happen in the movie), Shin about to fight Raoh by charging straight at him, Raoh in manga accurate colors and more. The highlight of the first trailer is a purple alien like creature. A second early preview trailer was later released which again had several odd images, such as Bat and Lin encountering Uighur. 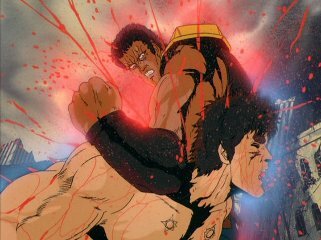 Originally, the movie ended with Raoh beating Kenshiro. However when the movie was released on video in Japan, the ending was changed, featuring new animation. 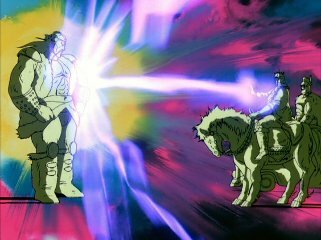 The new ending has Kenshiro and Raoh's battle ending in a draw. 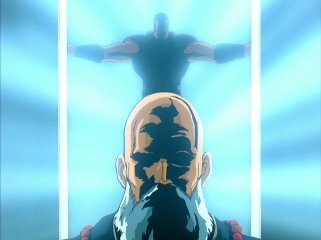 The new animation shows Ken and Raoh about to hit each other one last time, but Lin then appears. 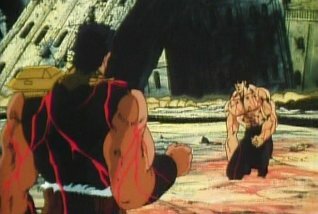 The revised ending was produced since the film's director, Toyoo Ashida, felt that the theatrical ending was unnatural due to the way Raoh abruptly decides to spare Kenshiro's life. The original ending, however, is the one featured on most DVD releases of the movie, with the alternate ending either being available as a bonus feature or not being included at all. There have been various different transfers of the movie over the years. 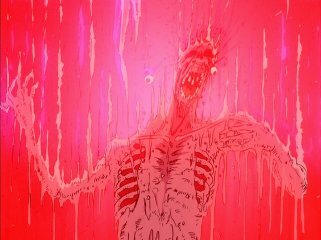 Most famously, when the movie was originally released on video, it was heavily censored so many of the most violent scenes had a blurring effect to make them look less gruesome. Currently, there is no completely uncensored version of the movie available and there may never be, as the original transfer has said to have been lost or destroyed. Some versions of the movie feature less censoring than others. It's all a bit confusing and if you want more information I suggest clicking the above link. -When Kenshiro is first seen, he is wearing his blue outfit from the anime series. But when he saves Bat and Lin the outfit he has on is much closer to the one he has in the manga. This outfit proved to be popular with fans and Ken wears it in Hokuto no Ken 2. -The main character from Vampire Hunter D (who is called D) has a cameo in this movie -he's in one of the crowd shots when Uighur shows everyone the flower. 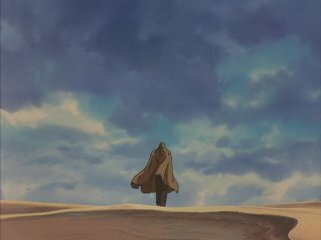 Kenshiro made a cameo appearance in the 1985 Vampire Hunter D movie. Both films were directed by Toyoo Ashida. -Also, in another crowd shot Arion from the Arion manga series can be seen. The Arion movie happened to also be released in March 1986.